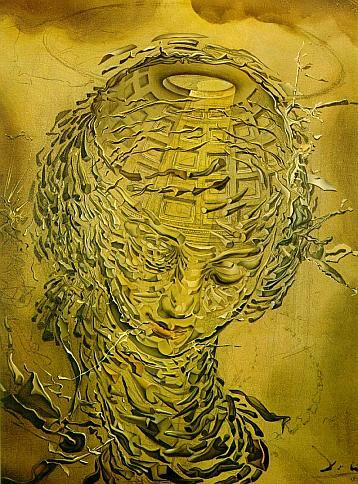 Salvador Felipe Jacinto Dalí Y Domenech was born in May 11, 1904, in Figueras, Spain, where he died in Jan. 23, 1989. In the early 1920s, he discovered Sigmund Freud's work - "The Interpretation of Dreams". In 1926, he first went to Paris and joined the Surrealists (poet André Breton and painters like Joan Miró, Max Ernst, Rene Magritte, etc.). Dalí used to induce hallucinatory states in himself through the "paranoiac critical method", as he named it, to release unconscious mental processes, when a visionary reality was reached and transposed to his paintings. His famous quote (1934) says it all: "The only difference between me and a madman is that I am not mad." Sigmund Freud once told him, "It is not the unconscious I seek in your pictures but the conscious."